Ill-prepared Malawi Under-20 national football team yesterday lost the opening 2018 Cosafa Youth Championship game 2-0 to hosts Zambia at Nkana Stadium in Kitwe. The Under-20 national team travelled to Zambia for the Under-20 Cosafa Championship without training due to what Football Association of Malawi (FAM) described as government’s late confirmation on availability of funds. Zambia earned the win in the second half through 59th minute substitute Prince Mumba’s brace, in a match monitored on Kwese Television. The game, started at a slow pace as both teams failed to get the better of the other in the opening five minutes. Zambia used home-ground advantage to settle first and on two occasions Malawi’s goalkeeper Charles Thom rescued his team with brilliant saves. The hosts started from where they had stopped from the first half and in 47th minutes Edward Chilufya missed a golden chance. 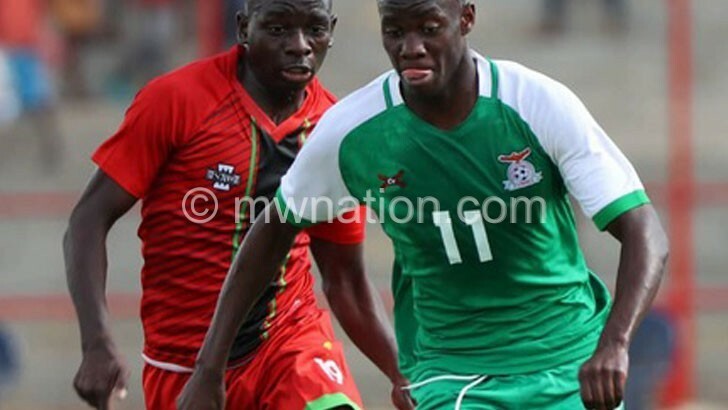 In the 55th minute, Malawi’s Peter Banda wasted a chance to score from a Chisisi Maonga cross. However, the Zambians continued pressurising the visitors and it was little wonder when Mumba hit the net in the 62nd minute after a good pass from William Malumbo beating the goalkeeper. Mumba scored the second goal in the 84th minute for Zambians to top Group A of the competition with three points. Malawi’s next game is against Mozambique and will face guest participants DRC in the final game. The top team and runners-up in each group will qualify for the next round of the competition. Speaking in a post-match interview, Malawi Under-20 team coach Meke Mwase attributed the defeat to loss of concentration on the part of the defence. “We were in the game for the whole of the first half, however, we did not translate the good form in the second half. We lost concentration, particularly in the defence and gave away those two goals,” he said. His Zambian counterpart, Charles Bwale, was over the moon following the win, saying it was a morale booster to win with a 2-0 margin in the opening match of the tournament. “Of course, we were not in the mood in the first half, we were not aggressive up-front. Still more, in the second half we get organised and earn the victory. This is very good start,” he said.